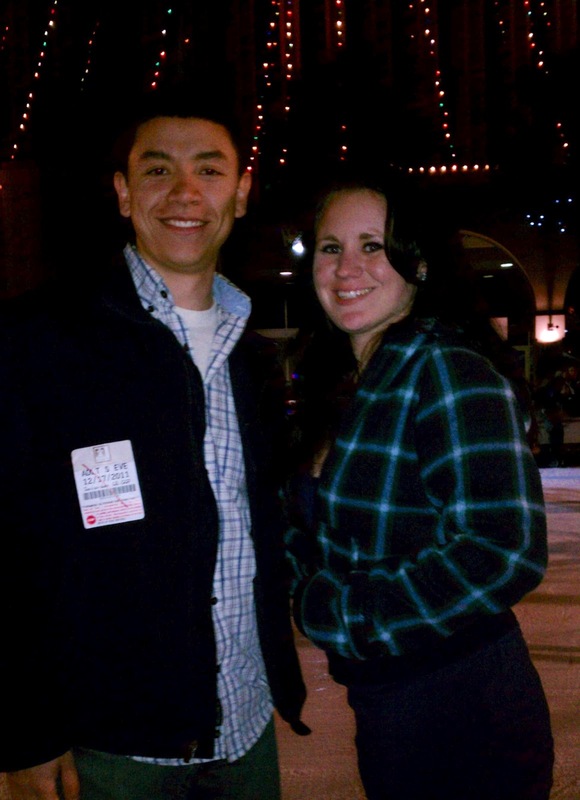 Last night I went ice skating for the 1st time and it was incredibly fun. The whole idea came into my head several weeks ago when I saw a news article on Riverside’s Festival of Lights. However, ice skating posed a serious problem for me, mainly because I try not to fall down in front of huge crowds – just not my “modus operandi”. But I still wanted to test my luck. Quite fortunately for me, my friend Tabitha came along with me. As southern California residents, we had discussed the level of skill required to ice skate and the almost obvious fact that we would fall on the unforgiving ice. I wanted to try ice skating but I also wanted her to go with me so we could fall together, equally distributing the embarrassment. When I proposed my idea to her and gave me my honest reasons, she laughingly agreed. So come yesterday evening, we met up at downtown Riverside and entered the long line waiting for ice skating tickets. My courage was fading fast, mainly because of the hundreds of people surrounding the rink while videotaping and photographing the falling skaters. It was my pride kept me in line. If my friend was going to ice skate, there was no way I was backing out, plus there was something about ice skating that challenged me and I was determined to beat it. After paying and receiving our skates, we sat down on a bench and laced them on the skates. When I stood up it felt as if I was attempting to learn how to walk again. We awkwardly strutted around for a few minutes, attempting to get used to the ice skates’ feel, then we joined the line of people making their way onto the icy rink. Our luck must have been perfect, because minutes before we got on the rink, the ice had been resurfaced. We gingerly stepped onto the rink firmly grasping the outside railing with both hands. My feet had no clue as to their methods of mechanics. They simply slid from side to side. The people on the ice around us had no clue either and they were falling left and right to the great amusement of the crowds surrounding the rink. After nearly a quarter of a lap around the rink hanging onto the railing, we sucked in our pride and pushed off from the railing. We moved so slowly and apprehensively, just waiting to fall. But we made steady progress. I cannot lie, if Tabitha had not come along, I would have fallen. Of course, I was the first to almost go down, but she caught me and saved my tattered pride. Thankfully Fate came to my rescue; several laps later, it was I who saved her from falling and we humbly agreed that we were even. After 15 or so laps, we actually were skating quite well. No fancy spins or moves, but we moved steadily and fluidly. We skated for nearly an hour just enjoying the fact that we were doing something we didn’t think we could do. It was fun to watch the little children who were skating so much better than the adults or teenager on the ice, and we still smirked with amusement at each clumsy fall. It was a miracle, that we never fell. Tabitha and I never quite grasped the concept of braking with ice skates so when people fell in front of us we had to slither around them just hoping for the best. Something about ice skating in front of all those people was like a constant adrenaline rush. Having successfully ice skated, I now feel so alive. It’s weird, but ice skating yesterday night was the highlight of my entire week and I want to ice skate again.